This narrow boat artwork was painted by hand, directly on to the sides of the boat, then protected with yacht varnish. The cost for a similar mural on both sides of a narrow boat is in the region of £6000, which is £3000 per side, or £500 per panel. I painted this lovely design on the sides of a 65 ft long narrow boat during the summer. 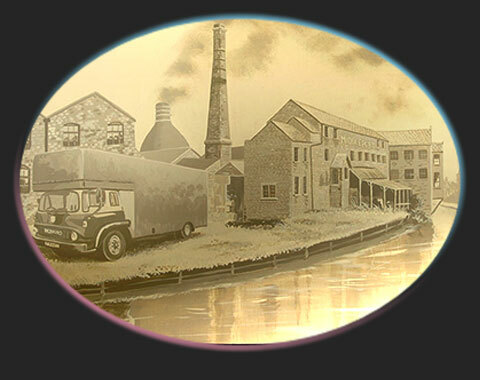 The mural artwork was based upon the boat owner's passion for the old potteries of Stoke-on-Trent. "The Potteries" narrow boat sits proudly in the water. This panel of the mural shows a local Smithy. Mural panel depicts Middleport Pottery, here captured in the 60s, and now featuring on the BBC's "Great Pottery Throwdown"
Burslam Town Hall, in a filed!